Although I posted this on Making me laugh, wanted to share it here. I was trying to read my kindle in bed before going to sleep and Twilight was not happy with me. She refuses to let me not pay attention to her, and let's me know she will get her attention one way or another. 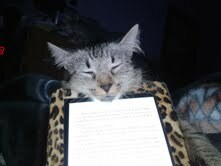 When I tried to move the Kindle she grabbed it and held on.